This is a Chinese name; the family name is Jia. 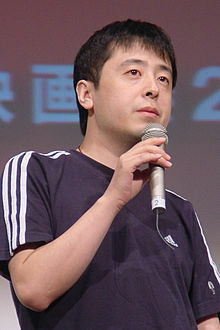 Jia Zhangke (born 24 May 1970) is a Chinese film director and screenwriter. He is generally regarded as a leading figure of the "Sixth Generation" movement of Chinese cinema, a group that also includes such figures as Wang Xiaoshuai, Lou Ye, Wang Quan'an and Zhang Yuan. Jia's early films, a loose trilogy based in his home province of Shanxi, were made outside of China's state-run film bureaucracy, and therefore are considered "underground" films. Beginning in 2004, Jia's status in his own country rose when he was allowed to direct his fourth feature film, The World, with state approval. Jia's films have received critical praise and have been recognized internationally, notably winning the Venice Film Festival's top award Golden Lion for Still Life. NPR critic John Powers praised him as "(perhaps) the most important filmmaker working in the world today." Upon graduation, Jia embarked on his first feature-length film, with producer Li Kit Ming and cinematographer Yu Lik-wai. Xiao Wu, a film about a pickpocket in Jia's native Fenyang, emerged from Jia's desire to capture the massive changes that had happened to his home in the past few years. :191 Additionally, the film was a rejection of what Jia felt was the fifth generation's increasing tendency to move away from the reality of modern China and into the realm of historical legend. :192 Shot on a mere 400,000 RMB budget (or about US$50,000), Xiao Wu would prove to be a major success on the international film circuit, bringing Jia a deal with Takeshi Kitano's production house. Jia capitalized on his success with Xiao Wu with a two internationally acclaimed independent features. The first, Platform, was partially funded in 1998 through the Pusan Promotion Plan (PPP) of the Busan (Pusan) International Film Festival when Jia received the Hubert Bals Fund Award (HBF) for his project. (Ahn, Soo Jeong, The Pusan Film Festival, South Korean Cinema and Globalization, 2012, 104-105). Platform was a three-hour epic about a provincial dance and music troupe transitioning from the 1970s to the early 1990s. The film has been called the masterpiece of the entire sixth generation movement. Starring Wang Hongwei, Jia's classmate and star of Xiao Shan Going Home and Xiao Wu, Platform was also the first of Jia's films to star actress Zhao Tao, a former dance teacher. Zhao would go on to serve as Jia's muse as the lead female role in Unknown Pleasures, The World, and Still Life, as well as acting in 24 City and the short film Cry Me a River (both in 2008). With 2002's Unknown Pleasures, Jia began a foray into filming in digital video (although his first experimentation with the medium came a year before, in 2001's short documentary In Public). Xiao Wu, Platform and Unknown Pleasures are sometimes seen collectively as an informal trilogy of China's transition into modernity. :184 Unknown Pleasures, a meditation on the aimless "birth control" generation to emerge from the one-child policy helped cement Jia's reputation as a major voice in contemporary Chinese cinema. All this despite limited theatrical runs and obscurity in mainland China. Indeed, none of the three films was ever publicly released in the PRC, although unlicensed DVD sales were brisk, a fact commented on by Jia near the end of Unknown Pleasures when Xiao Wu, the character (Wang Hongwei again), attempts to buy the DVD of Xiao Wu, the film. Beginning with 2004's The World, Jia began to work with official approval from the Chinese government. The shift from independent to state-approved was not in isolation, however, but was part of a broader movement by many "underground" film directors turning legitimate. For many critics, the shift to legitimacy did not blunt Jia's critical eye, and The World was well received both abroad and – somewhat surprisingly – by the Chinese government. Taking place in Beijing World Park, the film was also Jia's first to take place outside of his home province of Shanxi. In 2006, Jia returned to his experimentation with digital film with his film Still Life. The film would see Jia's status both at home and abroad raised when it won the coveted Golden Lion in the 2006 Venice Film Festival. The film, a diptych film about two people searching for their spouses in the backdrop of the Three Gorges Dam, was accompanied by the companion documentary Dong, about artist Liu Xiaodong. The 2000s have seen Jia at a prolific period of his career. Following the success of Still Life, Jia was reported to be working on a gangster film, The Age of Tattoo ("Ciqing shidai"). Originally planned to be released in 2007, production on The Age of Tattoo was delayed after lead Jay Chou pulled out of the project, with Jia moving on to other films. These included a second documentary, Useless, about China's clothing manufacturing business, which garnered the director the Orizzonti Doc Prize at Venice in 2008, and 24 City, an ambitious work that conveys the historic changes that have swept across China in the last half-century through the lens of a single factory and the people connected to it by labor and blood. At the London Film Festival, 24 City was accompanied by another Jia short film, Cry Me a River, a romance starring Summer Palace actors, Hao Lei and Guo Xiaodong, and Jia regulars Zhao Tao and Wang Hongwei. I Wish I Knew is a documentary exploring the changing face of Shanghai. I Wish I Knew debuted in the Un certain regard competition in the 2010 Cannes Film Festival. During the press conference of 18 April 2013, Jia's film Tian Zhu Ding (A Touch of Sin) was nominated for the Palme d'Or at the 2013 Cannes Film Festival. He won the award for Best Screenplay. In April 2014, he was announced as a member of the main competition jury at the 2014 Cannes Film Festival. His 2015 film Mountains May Depart was selected to compete for the Palme d'Or at the 2015 Cannes Film Festival. In October 2017, Jia announced the establishment of the Pingyao International Film Festival (PYIFF) in Shanxi. Jia's films treat themes of alienated youth, contemporary Chinese history and globalization, as well as his signature usage of the long-take, colorful digital video and his minimalist/realist style. The World, in particular, with its portrayal of gaudy theme park filled with recreations of foreign landmarks is often noted for its critique of the globalization of China. Jia's work speaks to a vision of "authentic" Chinese life, and his consistent return to the themes of alienation and disorientation fly in the face of the work of older filmmakers who present more idealized understandings of Chinese society. Critic Howard Feinstein described the director as a "rare breed of filmmaker capable of combining stunning artifice with documentary truth." Critics have noted that whereas "Fifth Generation" filmmakers such as Zhang Yimou churn out export-friendly and lushly-colored wuxia dramas, Jia, as a "Sixth Generation" filmmaker, rejects the idealization of these narratives in favor of a more nuanced style. His films, from Xiao Wu and Unknown Pleasures to Platform and The World, eschew the son et lumière that characterizes so many contemporary Chinese exports. But the films' recurrent and reflexive use of "pop" motifs ensure that they are more self-aware than the similarly documentarian Chinese films of Jia's Sixth Generation peers. Jia has commented in the past on the influence of filmmakers Hou Hsiao-hsien and Yasujirō Ozu on his work. I Wish I Knew, a 2010 documentary of his, features a segment about the 1972 documentary Chung Kuo, by Michelangelo Antonioni – another filmmaker to whose work Jia's own has been compared. 1995 Xiaoshan Going Home 小山回家 59 minutes Student film featurette. 1997 Xiao Wu 小武 108 minutes Feature film debut. Also known as Pickpocket. Screened in the "Forum" section at the 48th Berlin International Film Festival. 2000 Platform 站台 154 minutes Screened in competition at the 57th Venice International Film Festival. 2002 Unknown Pleasures 任逍遥 112 minutes Screened in competition at the 2002 Cannes Film Festival. 2004 The World 世界 143 minutes Screened in competition at the 61st Venice International Film Festival. 2006 Still Life 三峡好人 111 minutes Screened in competition at the 63rd Venice International Film Festival. Winner of the Golden Lion. 2008 24 City 二十四城记 112 minutes Screened in competition at the 2008 Cannes Film Festival. 2013 A Touch of Sin 天注定 133 minutes Screened in competition at the 2013 Cannes Film Festival. 2015 Mountains May Depart 山河故人 131 minutes Screened in competition at the 2015 Cannes Film Festival. 2018 Ash Is Purest White 江湖儿女 150 minutes Screened in competition at the 2018 Cannes Film Festival. 2010 I Wish I Knew 海上传奇 125 minutes Screened in the "Un Certain Regard" section at the 2011 Cannes Film Festival. 1994 One Day in Beijing 有一天，在北京 Student film. 1996 Du Du 嘟嘟 Student film. 2001 In Public 公共场所 30 minutes Documentary. 2001 The Condition of Dogs 狗的状况 6 minutes Documentary. 2008 Black Breakfast N/A 3 minutes Documentary. Segment in the anthology film Stories on Human Rights. 2009 Remembrance 十年 12 minutes Documentary. 2011 Cao Fei 4 minutes Documentary. Segment in the anthology film Yulu. 2011 Pan Shiyi 3 minutes Documentary. Segment in the anthology film Yulu. 2011 untitled short 3 minutes Documentary. Segment in the anthology film 3.11 Sense of Home. 2013 untitled short 2 minutes Documentary. Segment in the anthology film Venice 70: Future Reloaded. 2017 Revive 逢春 18 minutes Segment in the anthology film Where Has Time Gone?. 2019 The Bucket 5 minutes 30 seconds Chinese New Year – The Bucket – Apple. Jia Zhangke Speaks Out: The Chinese Film Director's Texts on Film. Piscataway, NJ: Transaction Publishers, 2014. ^ a b c d e Lee, Kevin. "Jia Zhangke". Senses of Cinema. Archived from the original on 12 September 2007. Retrieved 22 September 2007. ^ a b c d e f g h i j k Berry, Michael (2002). "Jia Zhangke: Capturing a Transforming Reality" in Speaking in Images: Interviews with Contemporary Chinese Filmmakers. Columbia University Press, ISBN 0-231-13331-6. Google Book Search. Retrieved 2008-09-09. ^ Said, S F (28 June 2002). "In the Realm of Censors". London: Daily Telegraph. Retrieved 9 September 2008. ^ It's worth noting that this movie is financed by Ichiyama Shozo from T-Mark company. T-Mark is established by Japanese artist Kitano Takeshi to invest in Asian arthouse films and Ichiyama Shozo is an experienced in producing Chinese-language movies. Ichiyama has worked on many movies of Hou Hsiao-Hsian and Edward Yang, as well as some other movies by Jia. Michael Berry (2009). Xiao Wu. Platform. Unknown Pleasures: Jia Zhangke's 'Hometown Trilogy'. p. 50. ISBN 9781844572625. and Darrell William Davis and Emilie Yueh-Yu Yeh (2011). East Asian Screen Industries. p. 73. ISBN 9780230277670. ^ See for example, Mitchell, Elvis (28 September 2002). "Unknown Pleasures: New York Film Festival Reviews; Chasing A Dream But Getting Nowhere". The New York Times. Retrieved 6 September 2008. ^ Hu, Brian (17 February 2005). "Asia Pacific Arts: Presenting the World". UCLA Asia Institute. Archived from the original on 4 May 2007. Retrieved 27 February 2007. ^ a b Kraicer, Shelley (2004). "Lost in Time, Lost in SZpace: Beijing Film Culture in 2004". Cinemascope 21. Archived from the original on 12 May 2008. Retrieved 6 January 2009. ^ Associated Press (9 September 2006). "'Still Life' Takes Venice's Top Prize". CBS News. Retrieved 6 January 2009. ^ "Three Upcoming Projects of Director Jia Zhangke". CriNordic.com. 23 March 2007. Archived from the original on 1 December 2007. Retrieved 22 September 2007. ^ "Venice Film Festival Winners". Australian Broadcasting Corporation. 2007. Retrieved 14 February 2009. ^ "Ang Lee wins second Golden Lion at Venice Film Festival". Xinhua. 9 September 2007. Retrieved 14 February 2009. ^ "24 City (Ershisi Cheng Ji)". British Film Institute. Archived from the original on 14 September 2008. Retrieved 19 September 2008. ^ "2013 Official Selection". Cannes. 19 April 2013. Retrieved 19 April 2013. ^ Times, Global. "Chinese director Jia Zhangke establishes Pingyao International Film Festival in his home province of Shanxi - Global Times". www.globaltimes.cn. Retrieved 20 October 2017. ^ Rapfogel, Jared (December 2004). "Minimalism and Maximalism: The 42nd New York Film Festival". Senses of Cinema. Archived from the original on 16 July 2011. Retrieved 26 February 2007. ^ Kraicer, Shelly. "Lost in Time, Lost in Space: Beijing Film Culture in 2004". Cinema Scope No. 21. Archived from the original on 6 February 2007. Retrieved 26 February 2007. ^ Chang, Rebecca (September 2007). "China's Generation Gap". PopMatters. Retrieved 4 December 2007. ^ Chan, Andrew. "Interview: Jia Zhangke". Filmcomment. Retrieved 2015-07-22. Wikimedia Commons has media related to Jia Zhangke.